There is a recreation of the auditorium with original seats and fixtures at the Flat River Museum. Bob Martin, son-in-law to Bert Silver, was manager of the theater for many years. He directed an orchestra that played at every show, I believe, between the years of 1922 to 1936. When the theater was wired for sound in 1929, the orchestra continued playing music before the show would start. He gave me the music from the orchestra's library when I was orchestra director at GHS. He used posters (lobby cards) as folders for the music. The posters have been de-acidified and are stored at the Flat River Historical Museum. The museum houses a small movie theater with some of the artifacts from the Silver Theater. For 2014, the museum has an exhibit entitled, America's Pastimes which includes a display of items and photos of the Silver and Gibson Theaters in Greenville. The museum is open on weekends from 2-4:30 pm from April through December. I am not from the Greenville area, but my husband's family lives there. Recently, he was able to acquire the old popcorn making machine, which his uncle purchased at auction when items were sold from the Silver Theatre. He is so proud to have it,and it is in good shape, including the glass. We'd like to put the lettered signs in the top, as the originals are not there. does anyone know what they may have said, or looked like. 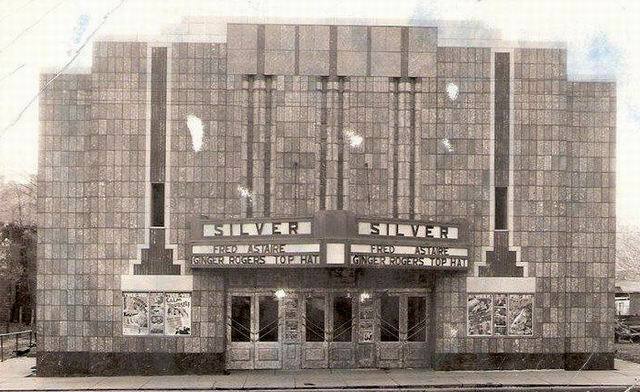 My Grandmother, Maxine Hedger, was the Manager at the Silver Theatre for many years. It was a great place to go as a young child. 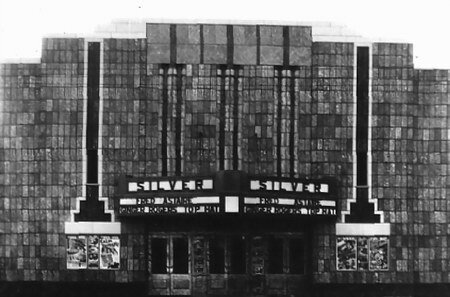 I certainly miss the theatre, and wish I had gotten a couple of seats from the Silver Theatre before it was torn down. I was raised in that theater, as my mother had worked there for years. I was in several parades for the theater as a little girl. I have a lot of fond memories there. Back when star wars came out all the way to pink floyd the wall. Mr.
Butterfield had ownwd it at the time and a ladie Maxine Hedges was the manager. my mothers name was Joyce. For all of Greenville I miss my town family and friends. Hello: My great grandfather was Bert Silver. My grandfather was Guy Silver, his son. I remember coming to Greenville and Crystal as a child to visit family and see the places that the family used to live and have the theatre and winter the Circus. I especially have fond memories of my grandfather doing magic tricks for us as kids. I have his old juggling pins and photos of him performing in the circus. I would love to obtain copies of any old theatre flyers, if you have any. Music was a very HUGE part of this family''s life. Thanks for sharing on this site!. 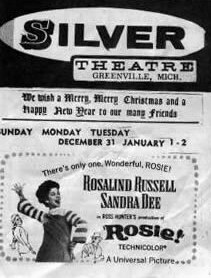 I''ve lived in Greenville for 32 years and remember going to the Silver Theater. A parking lot is all that remains. It was not a bank at one time. You can stop at the Flat River Museum in Greenville and step back in time to revisit the Silver Theater. Ah!!!! memories!!!!!. 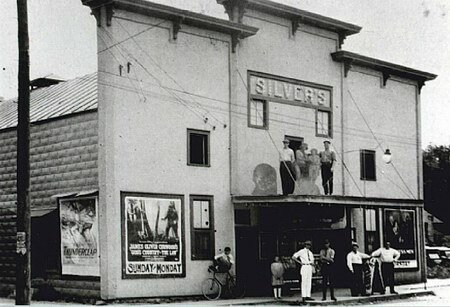 The Silver Theatre was founded in Greenville, MI by Bert Silver. Bert had a long history in area show business. In 1904 he started tent shows and had the first motorized circus in the U. S. with four touring cars, four trucks, and an advance car. Bert and his entire family played in the Silver Family Concert Band both as part of the circus, and in their own concerts. In 1916 the circus was disbanded because the U. S. Army appropriated its vehicles and tents for their efforts in WWI. Earlier, in 1909, Bert opened a theatre in what is now the bank building in downtown Greenville (picture 2). 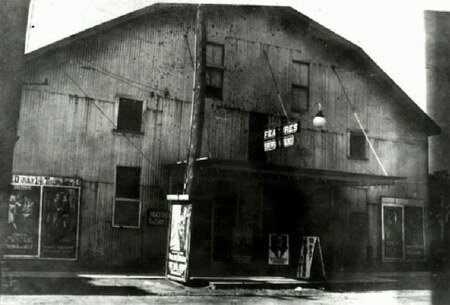 In 1915 he purchased the Phelps Opera House and renamed it the Silver Theatre (picture 3). In 1939 it was sold to Butterfield Theatres, with one of the conditions being that they had to provide a seat for Bert at any of the shows for the rest of his life. 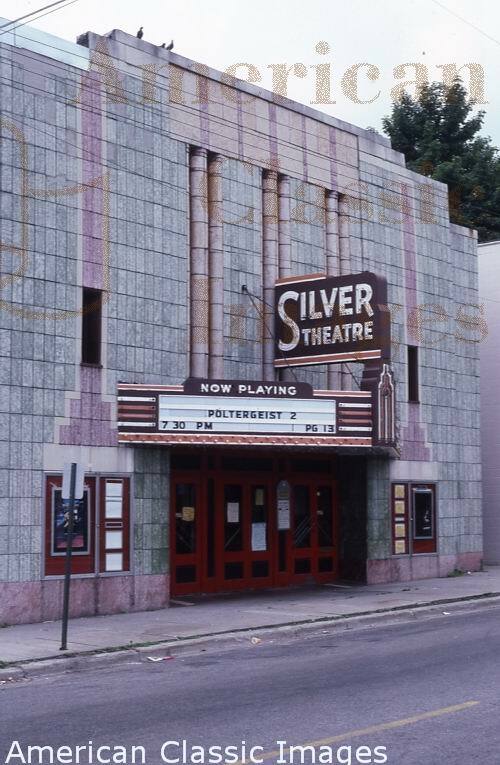 The Silver was a mainstay of Greenvilles downtown providing concerts and movies for generations of area residents before sadly being torn down in June of 1988. It is now a parking lot.